I found myself in Borders’ Queen Street bookshop yesterday, and it was a sad world full of failure. Let’s have a wander through the store, and see not only how their business is failing, but how they fail at business. First up – the magazine section. The latest Wired magazine, air freighted to be here in New Zealand quickly, was a February edition. 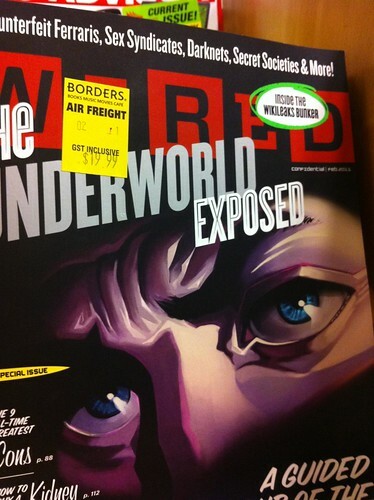 In the USA, where Wired is published, magazines typically come out before the month on the cover. So this Wired magazine is from January – which is now 5 months ago. There were several copies, and with no discount they certainly were not being sold. I suspect that the buyers for Borders are very busy cancelling as many orders as they can, while the stores are just trying to move inventory. The price is outrageous. The $19.99 cover price is for one issue – while the price to subscribe to Wired in the USA is just $10 -and not per issue, but per year. We in NZ can subscribe to wired for US$70 a year, which is just over one third of the cost of buying older ones from Borders. In New Zealand we can also buy Wired for the iPad for $5.29 per issue – provided you don’t mind downloading over 300mb of content or the average one star rating for the latest version. I’d avoid for now. Next up – the display of books in Borders, which leaves much to be desired. 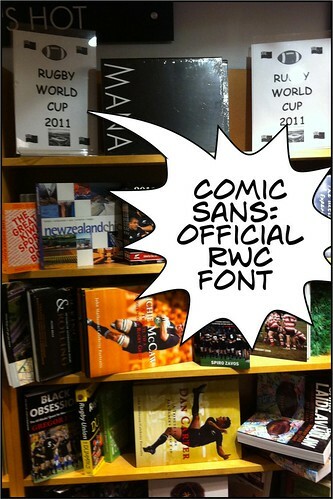 Here’s a picture from a tweet I sent – the Rugby World Cup book display. Kudos to the staff for making up a couple of signs, but the amateur nature of said signs doesn’t belong in a premier bookstore. 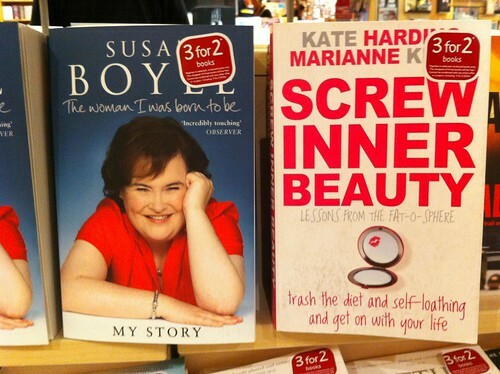 I also found it too hard not to tweet this picture – unfortunate juxtaposition which I admit was slightly aided by me moving the Harding book two titles to the left. All of their catalog computers were out of order, so browsing was the only option. That’s ok, as if I wanted to search for a book I would have used Amazon, Fishpond or MightApe. The Kobo on display was a poor advertisement for eBooks. It’s incredibly slow and essentially unusable. Go for Amazon’s Kindle, which is everything it needs to be – except for being waterproof, so use in the bath is out. the prices were often not compelling. This NZ$25 one was available from Amazon for US$6.40, or just US$2.51 used. Book prices in general are exceedingly high here versus the USA, so it’s a wonder that we sell many books at all. The same book is on Fishpond.co.nz for $26.97, every day, not on special, but that’s still a lot. 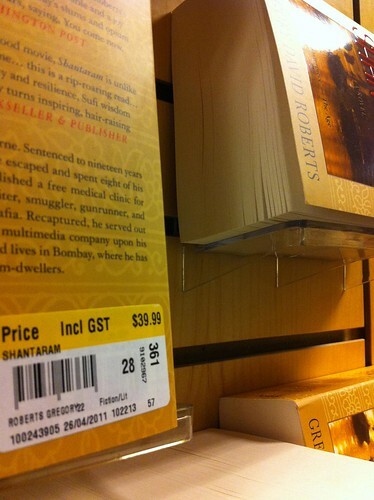 Another reason why Borders is ultimately a lousy business is explained by Shantaram, which is a decent book that I do recommend, but is physically enormous and enormously expensive. It’s heavy to carry around, heavy to hold as you read, and must be expensive to make and ship. So instead of buying the physical book, why not buy the same book an Amazon for US$9.99 (about a third of the cost), and download it instantly to a Kindle? The Kindle itself is light, and holds a library of books which we can have with us at all times or download at will. 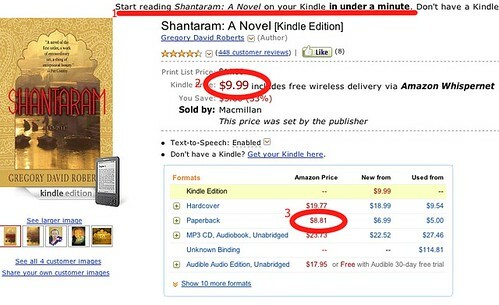 Amazon’s paperback version of Shantaram is actually cheaper than their eBook – recognising perhaps both that the eBook is a superior option and that Amazon needs to be rid of all of those heavy paper volumes. The next book is interesting, as Amazon fails and succeeds. 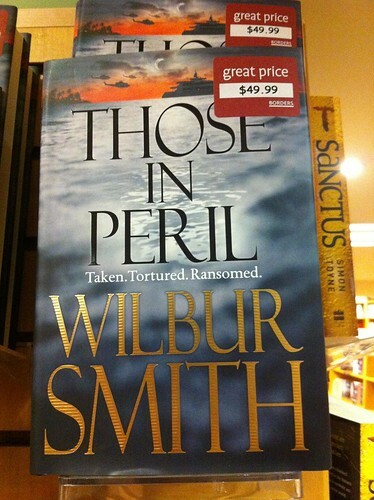 This latest Wilbur Smith novel is a staggering $50 to buy from Borders – which is not, however you label it, a great price. However it’s not yet available on the Kindle in the USA, so perhaps Borders is on to something, making us pay more for the benefit of an earlier read? 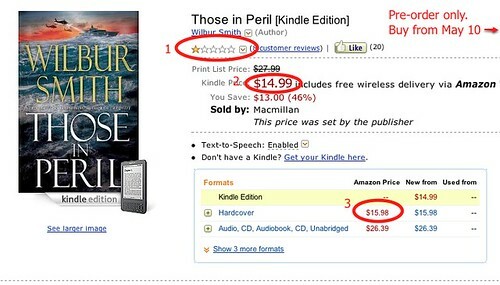 Not so – as Amazon also allows us to read reviews – and for this book Wilbur Smith’s fans (and I was one as a young teenager back in 1923) are pretty angry, and the average rating is just one star. Once again and of course the price is a lot cheaper on Amazon – the hardcover price is US$15.98, or about 2.5 times less than the one on display in Borders NZ. While Borders did actually have some books at very cheap prices, the books themselves were often amusingly out of date. This blue stickered book was just $2, and proudly displayed near the front door. 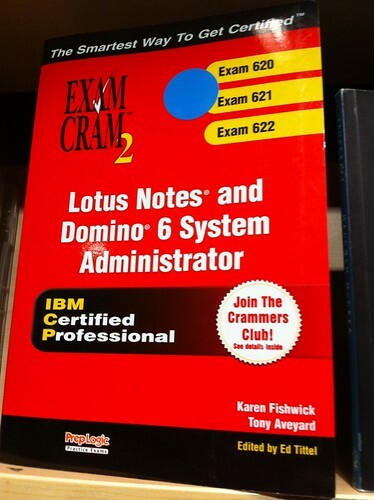 I suspect the market for it is small as Domino 6 was released in 2002 and superseded in 2005. Borders is squeezed not just from online, which is increasingly the choice for people that read a lot, but also from discounters such as The Warehouse. The Warehouse doesn’t have to stock a wide range of books, and views them as just one product range in a portfolio. Borders is pretty much stuck with selling only books, and will just see the slow demise of their core business as reader migrate to eBooks and beyond. Whitcoulls diversified away from being a decent books store years ago, but they are also squeezed by online and offline suppliers like Warehouse Stationary. 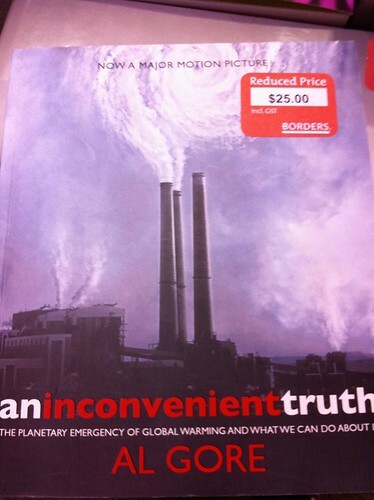 Behold another Al Gore example – his new publication is called “Our Choice”, and it’s available only on the iPad. It, what ever it is called, for it certainly is beyond a book, is a combination of text, diagrams and pictures, videos and speech. It features Al himself but also snips from other speakers, movies and articles, and is well worth a look for the format alone. 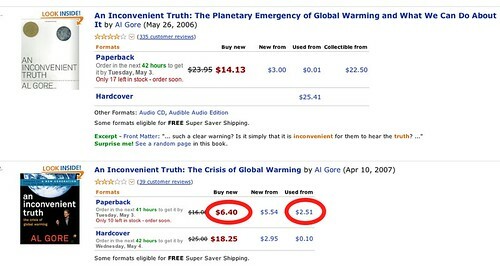 It was $6.49 or so – far beneath the cost Gore’s An Inconvenient Truth, and with appropriately low distribution costs and environmental impact. Someone has just purchased, or not, the NZ assets of RED. I really hope they have a long term perspective on the declining future of books. The most avid readers and purchasers will increasingly purchase eBooks from mainly offshore, while the mass market can be served by discounters. 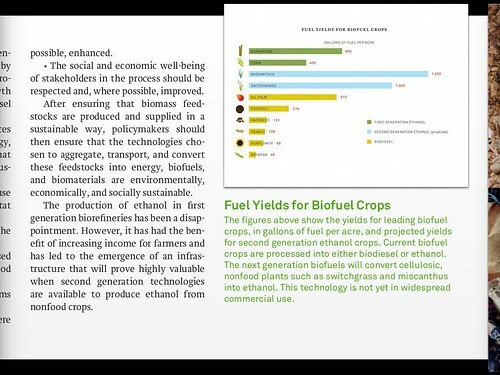 Printing, distributing, stocking and displaying books is slow, expensive and environmentally irresponsible, and new technology is superior in essentially every way. It will take time for Amazon to really break through with their Kindle in New Zealand, but for me the game is already over. It’s sad – I enjoyed browsing the Borders and Barnes & Noble stores in the USA, and I also enjoy Unity books and similar stores that are great at selecting quality content. But it’s now a lousy business to be in, and those stores will go the way of CD stores and will be fighting with the DVD chains for the best bankruptcy lawyers. I remember when the Borders in Auckland opened, 12-ish years ago. It was kind of overstocked, but in a way that was only bad for management. For the reader, it was a wonderland of lovely books, a selection and range that New Zealand had never seen more. I loved just spending hours their browsing – and buying. But now bookshops aren’t as much fun. Whitcoulls feels like a variety store with a little book corner, and Borders seems focussed on new releases with little back catalogue. Meanwhile, a few months ago I became disgusted with my overloaded bookshelf and removed about three-quarters of my books with the intention of donating them to this year’s book fair. I’ve only kept books that are special to me – ones that wouldn’t be the same (or even available) in electronic form. And – side observation – as physical books become less desirable, we start to see old books used as decoration in cool Wellington bars like The Library and Duke Carvell’s. Books used for their covers, not the content within. I figure it’s only a matter of time before I get a Kindle. You are lucky you got to take those photos. I tried to take a photo in borders a few months ago and was instantly pounced on by a staff member. She more or less said if I took another photo I’d be kicked and banned from the store. I choose not to test her on this but I’ve avoided the place (I used to read the magazines and buy the overpriced coffee) since. 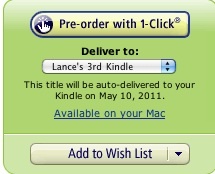 Lance, I see you linked to your old post about the Amazon Kindle not being sold in New Zealand… This is true for the old Kindle DX. Kindle Next Generation, the 6″ one with WiFi and optional 3G, is available for purchase from Amazon including New Zealand. Don’t forget the book depository. Free delivery to NZ although Amazon UK has the same deal on offer at the moment. Borders here in Christchurch is rapidly getting hollowed out. Every weekend is more poor material discounted down to very little being pushed out the door. When I first visited a month ago I was shocked at how their entire CD area was gone. Nothing but top 20 CDs. The DVD section was decimated. 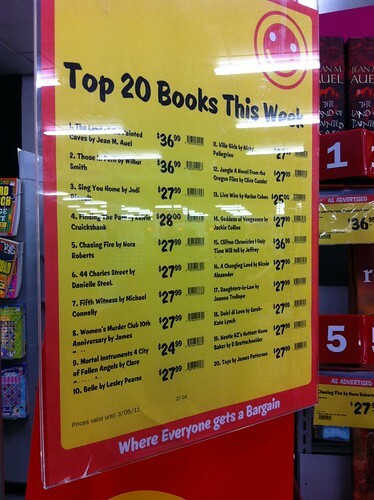 Many of the books on sale have that just bought in from Whitcoulls to be shifted quick. The computer books section used to be very good but started going downhill some time ago when Whitcoulls bought the business. There is still some good stuff to chose from but so much of it is the 500+ pages monsters about technology. The SF section has got more and more reduced in size and it is almost impossible to buy a book that isn’t part of some series. However, they don’t seem to stock the whole series, not even #1 to get you hooked. My next book purchase will be One of Our Thursdays Is Missing. I will be buying it form the book depository for around $25 instead of the outrageous $3?.99 it will be priced at here. For a few buck more I could even get the hardback. My favourite bookshop in Christchurch is trapped behind the cordon. Scorpio’s is a lovely shop to visit. It knows its client base andits staff know their stuff. A great joy to visit. So much so I don’t mind their prices anywhere near as much as I detest those in Whitcoulls. My current take on Borders is that they are selling stock off as fast as possible to keep afloat. Once the stock is gone there is no business left. A “young teenager back in 1923”? – you must be so old! I am amazed that any book store manages to stay open these days, there must be only a very small portion of the population that purchases from a book store – let alone a large chain store. Although I do (or at least did when it first opened) love the Borders store in Queen St (Auckland), I admit I have purchased very little if anything from there. It’s more akin to a libray, somewhere to browse and relax (and max out the credit card if so inclined). I’ve never been a fan of Borders – the shop is run with all the care and attention of a second-rate supermarket. Sure you can say the same about buying books at the Warehouse – but at least they are cheap. I’m happy to pay full price in shops like Unity Books – there’s also a neat small boutique bookshop in Takapuna. 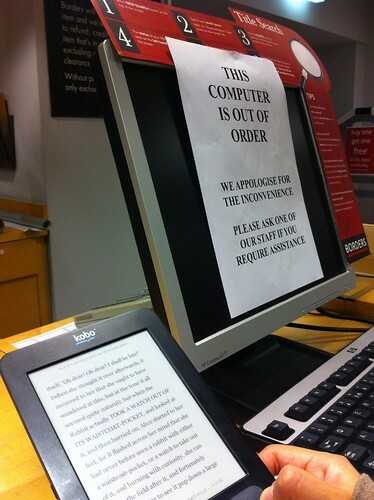 Book retailing is like a few other industries that have been allegedly wrecked by the Internet. Music, newspapers and TV. In each case the industry itself was already in trouble long before people sat in their pyjamas typing www before doing their shopping. Currently doing a pictorial series on the downfall of Borders.